Manchester United have finally concluded the signing of Chilean superstar, Alexis Sanchez from Arsenal. The transfer of the former Arsenal player has been the subject of speculation in the past few days but that has been laid to rest with the announcement of the striker, who will wear the famous no 7 jersey at United. The club trumped Manchester City to the signing of the player, which in itself was a statement of intent that the Premier League race is not a forgone conclusion like many thought it would be. Sanchez, who had been to the Home Office earlier in the day to update his work permit beamed for the cameras as he looked truly delighted to join one of the biggest clubs in world football. The former Arsenal player had never hidden his intention to leave the Emirates squad stadium for a bigger and well-placed club, joining United who are looking like a team on a mission with the recent recruitment. The player will reportedly earn around £450k-a-week at Old Trafford, highlighting his ascension to one of the game’s most astounding figures. Sanchez had teased United fans about an imminent move on Sunday after he posted a selfie of himself wearing the club’s jersey after his medical at Carrington. 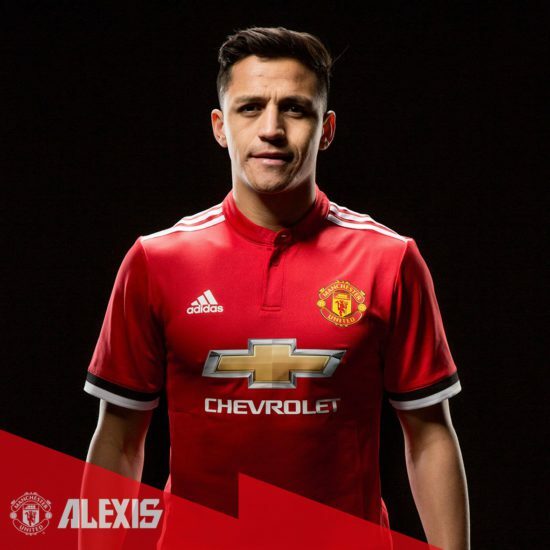 A statement on the club’s official website read, “Manchester United is delighted to announce the signing of Alexis Sanchez from Arsenal in a deal that sees the Armenian midfielder Henrikh Mkhitaryan move in the opposite direction”. The player looked genuinely happy and spoke about the opportunity to play for such an illustrious club. Sanchez joins on a four and a half year deal and is in line to make his United bow away at Yeovil Town on Friday in the FA Cup fourth round. Let’s wait 4 him to prove that he’s worth that wage per week.But though,that’s a big boost to united squad.wooh! what a signing!!!!!! !